Oh my goodness. I may never eat again. I don't think I have ever eaten so much food. The trouble is, you know when food is just sooooo lovely, you don't want to stop eating, even though you seriously risk exploding like an over-inflated barage balloon? At Bella Italia it's all about flavour. Not just the flavour of the food, which was epic, but also the flavour of Italy. It's everywhere, from the decor, to the titles of the dishes on the menu. My first impression of the venue was extremely positive. It was very clean and well organised, but the part that I really appreciated was the atmosphere, it was just so friendly and welcoming. It's half term, and at Cabot Circus, Bristol, the place was absolutely heaving. There were people queueing to get in, every table full, children, babies, the lot and every waitress was smiling and helpful. This made for a very pleasant dining experience and we were almost oblivious to the other diners entirely. My son was very taken with our waitress, Angelica, who couldn't have tried harder to make him comfortable and ensure he was entertained. 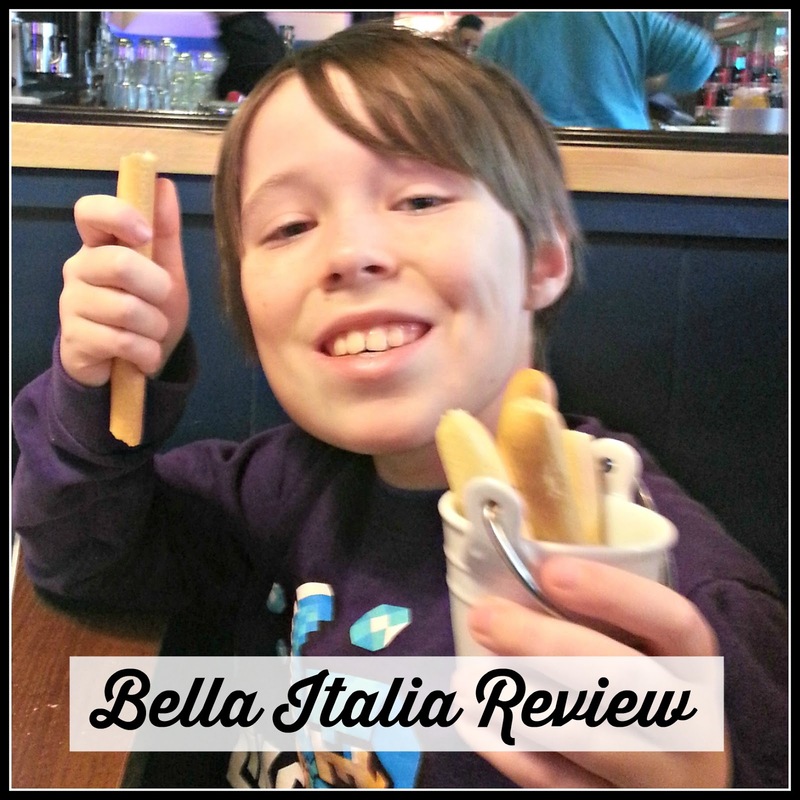 On arrival, he was given crayons, a huge activity sheet, with lots to do, and an adorable little bucket containing L-sized breadsticks! One happy, amused small boy. Not that we had to wait long for our starters anyway. The service was very swift, particularly considering how busy they were! L had Cheesy Garlic Bread, which was extremely well received. I tried a piece, and I have to say, it was lovely. Exactly the right consistency and not too garlicky. I had Funghi Arrosto. Which was quite possibly the most delicious starter I have ever had. Ever. It was just amazing. Baked mushrooms, in a garlic and spinach sauce, with marscapone and topped with mozarella. Perfect. Jade had Mini Garlic Bastoni, which were tiny bread batons with a sauce of garlic and parsley, which had the consistency of melted butter, and felt deliciously decadent as a dip! The children's menu is split into two categories, Piccolo, for ages two to six (£5.45) and Grande, for ages seven to eleven (£7.95). I really love this idea, because L is nine now and, although he can't really eat an adult meal, he's not a toddler either! 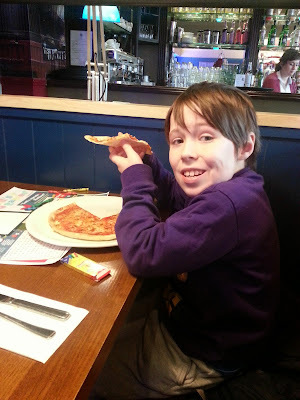 For his main course he chose a smaller version of the Margherita Pizza from the adult menu. It wasn't much smaller though, and was very sizeable for a child's portion. I would like to mention, at this stage that L is not the easiest child to please. His fussy eating has been previously documented here and it's safe to say, if you can please him, you can probably please anyone. He loved it, even told the waitressit was the loveliest pizza he had ever eaten. A roaring success! Jade had a 'create your own' pizza, ham and mushroom, and I had a beautifully cooked steak. Oh yes, steak. Not just pizza and pasta in this Italian restaurant. Even the children's menu features fish and chips and burgers, even salmon! Which is perfect, because you can even bring along those strange family members who don't like traditional Italian food (weird!). Included in the price of the children's menu is the starter, main, dessert, nibbles and drink. Sides are just £1 extra. It really is incredible value for the amount of food you get. The drinks are really fun too. L was a bit unsure, but for the more adventurous there are a range of exotic 'Mocktails' that you can mix at the table, for an exciting colour change before your eyes! For dessert, Jade opted for the Gelato menu, where you can choose three scoops of ice cream, and three toppings from a huge selection. Her choices included bubble gum ice cream, popping candy and candy floss! There were lots of other dessert choices, I had a delicious giant profiterole, with raspberry coulis. L had the choice of Cookie Dough Cake, Choccie Brownies, or Fruit Salad, with other choices available for 75p extra. He also plumped for the ice cream, though, and it's not hard to see why. All the pretty colours look so appealing, on display at the Gelato Cart. My only small criticism though, is that the older child's portion was really small, compared to the adult's. L didn't mind too much, although he did comment on it, I could understand him feeling a little put out, I think they maybe need a two scoop option, for the older children's menu. 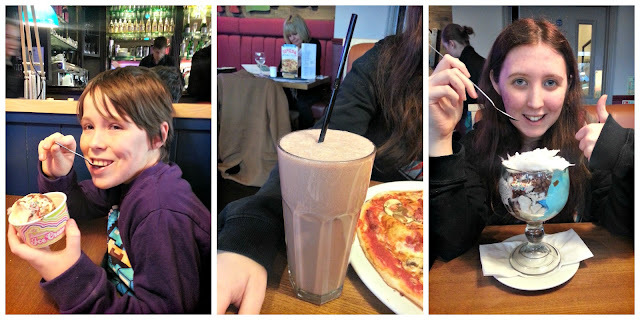 Overall though, we had a wonderful time and I would recommend the restaurant on service alone, but L is very keen to go back and, with his exacting tastes, that is all the recommendation any children's menu needs! I have to admit, I keep meaning to try out Bella Italia but have not been yet, and after reading your post I am kicking myself! Firstly it's great they have two options for children. Also I am a huge fan of baked mushrooms, as no one in my household likes mushrooms so I would definitely have that. Nice to see they do steaks too, yum.